Arcader is a Thunderkick-powered slot game with a retro-technology theme. Reminiscent of the 80s, it has plenty of modern-day features including sticky expanding wilds, free spins and multipliers. The Free Spins feature can give you 9 free spins with up to a 9x multiplier with the possibility to get expanding sticky wilds as well as access to the Mystery Game where you can win over 100 times your stake. Remember the early days of arcade gaming and addictive diversions such as Space Invaders, Galaxian and Phoenix? If you don’t you should track these games down online and check them out. Arcader is a brand new online slot from Thunderkick Games which uses those 64 bit games as the basis to develop a compelling reel experience. Arcadia plays out over five reels, three rows and fifteen paylines and the pixellated symbols spin on black columns which are themselves placed against a background of a dark, starry sky. The rocks of an alien planet make up the foreground. 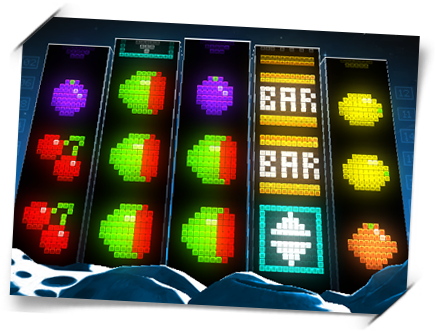 The base game symbols are all pixellated versions of traditional slot icons and include cherries, oranges, plums, lemons, watermelons, bells, sevens and bars. The special symbols include a ‘W’ wild, an arrow expander and two scatters – a ‘B’ and and ‘M’ – which activate their own features. The expander is a type of wild symbol and it will expand to fill all positions on a reel if it can form a win. It will only match one symbol but it will always choose the most valuable win available. With each spin there’s a chance that one position on reels two, three and four will be zapped into a sticky wild; any that land will remain in place for the rest of the spins. Landing three or more of the big ‘M’ symbols will trigger this second bonus feature and it’s a picking game. Four or five of the triggering symbols landed will mean a 2x or 6x multiplier respectively. 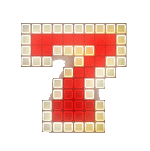 You will be prompted to choose from the grid of pixellated symbols available, each of which is worth a cash prize. Keep going until you find the red ‘X’ at which point the round is over. The look and feel of this game is fantastic even down to the female, slightly robotic voiceover which exclaims phrases such as “Awesome” and “Great” when you score good wins. The music is as genuinely annoying as it used to be with such games but you can easily reach for the mute button. Highly recommended. I don’t know why, but I just don’t like this Thunderkick game, is it me or I am just not lucky on them! Ok I might like the rest of the game they have even played all of them, but Arcader slot, I think that this is the ugliest game I have even seen, beside that, the winnings from this game are way to poor. Either this game need a lot of chance or lot of time and money to spend, because the winnings I was getting they were really hilarious, when I remember I wanted to try this slot and even spend few deposits ! This game it really remind me of many years ago, when the games were poor, with bad graphics just like this Arcader is or maybe that was made intentionally, to reminds us of that time how the games looked like. It has 5 reels with 15 pay lines, it has wild symbols and what I have read about this game its RTP is 96% well that is a lot, but where? To me not, well maybe the game wasn’t in the mood or my lady luck was gone that day or maybe I am not being fair so from only few times tested this game, maybe I should give it another chance! Well I see it like this, some of the games are for us and what some game are happy or good paying for someone else doesn’t have to be that, that slot must be acting the same for us. Well I started to think that way, I played this slot few times but I think this game is not made for me. Sorry Thunderkick maybe your game are nice, but they are not for me, unlucky I guess, because no matter what game I tried it doesn’t give me any good. Thunderkick is one of the new kids on the block when it comes to the online gambling industry, but that certainly doesn’t mean that they can’t compete with other casino software providers. Their games are different, fun and highly entertaining. Just like Yggdrasil Gaming they seem to be well aware of the needs of demanding slots players. If you’ve never played their games before, then I can certainly recommend trying them out starting with Arcader. This slot is simply astonishing and gives me flashbacks from 1994 when Nintendo and arcade games were hot. WARNING: Arcader is highly addicting! Nostalgia is an aspect I always can appreciate.This game pretty much takes you back to those golden years. Arcader contains 5-reels, 3-rows and 15-paylines. The slot itself is filled with all types of classic slot symbols, such as bars, sevens, bells, cherries, lemons, oranges and melons. But that’s definitely not all because this game also has some fantastic features. The minimum bet to play this game is 20 cents, but I played it on 1 euro bets for like 2 hours. The other features I’m talking about is the Expander symbol which can appear on reels 2, 3 and 4. If this symbol appears it expands and changes into the symbol that can ensure the highest possible combination. Furthermore, there is a very nice mystery bonus game which gets triggered if you get 3, 4 or 5 of those symbols. The more mystery symbols you get, the higher the multiplier is. 3 symbols ensures a 1x multiplier, 4 symbols a 2x multiplier and 5 symbols a 6x multiplier. I never came further than 3 mystery symbols though. During this bonus game you get taken a new screen. You then have to select the symbols with question marks one by one. The game ends when you pick an X instead of a fruit symbol. I’ve won 2x, 8x, 15x 20x and 38x bet with this bonus game. It triggers very frequently! The other bonus game to look forward to is the free spins feature. This one is a bit more difficult to trigger unfortunately. I only had it twice but it’s worth the investment, because it makes use of sticky wilds. After every spin a sticky wild gets added on reels 2, 3 and 4. If you collect 3, 4 or 5 bonus symbols you receive 9 free spins but the multiplier differs. The multiplier can be equal all the way up to 9x if you get five bonus symbols. I never had more than three of them but still won a nice amount of money with 90x and 140x bet. I also like those little announcements of “Nice Win”, “Awesome” and “Big Win” besides the fantastic retro background music. Basically this slot has everything a player would look for – entertainment, potential, good background music and innovative gameplay. The top payout for a 5oak bars is 20x bet. If you get 3 expanders or all wilds on reels 2, 3 and 4, with stacked bars on reels 1 and 5 then basically you have the max base game hit of 300x bet. Add the 9x multiplier if you get five bonus symbols and that exact situation in free spins, and then we have a possible jackpot of 2700x bet! I can’t complain, simply love this game and will continue playing it. A rare 10/10 rating for this game! Arcader is one of the best Thunderkick slots. It is the kind of slot where almost at every spin you feel like clapping your hands of happiness like a child. I discovered yesterday at noon this slot and until today I played here probable about 700-1000 spins. I am the kind of player who after 150-300 spins at one slot quits, but this game is addictive to the extreme. Somewhere on one of the planets or moons of our solar system was placed a giant TV screen. The landscape in the background where Saturn appears (most perhaps) along with the rocky and arid soil and with several small meteorites overflying at low altitude the slot itself is perfect. The slot on itself resembles very good to those childhood video games where after you threw a coin you had to deal with dozens of monsters stylized from only a few pixels. Here all the cherries, lemons, oranges and apples are stylized from just a dozen of pixels. And so you are like in front of a galactic computer that speaks to you and on which run all the symbols that occasionally stop to make you a winner. The slot and the whole landscape are shaking with each winning line. The symbols come stacked, and even more there are special symbols that when they occur, they always increase the wins. Thus, the arrows expand on a whole reel so as to increase at maximum the win. The Wilds when they are present, they occupy almost an entire reel. How great would be a column Wilds, followed by two expanded arrows? And once in a while you will have this chance. The Free Spins are equally captivating. At each Free Spin a meteorite falls on one of the symbols and turns it into a locked Wild for the remainder of the round. Too bad just that occasionally the meteorites fall in the same place. Still at the end of the Free Spins there will be about 5-7 Wilds on the reels. There is even a mystery bonus which I will let you discover by yourself. About wins I will say nothing. The game is too good to be ruined by some unconvincing statistics. Well, the slot is still running on my computer and probably I will continue playing here. Man I love 16 bit graphics it reminds me of the old time like Super Mario Bros. This game look very stunning with 16 bits and it looks very high definition for 16 bits graphics. Gameplay of this game is also very awesome. The best feature is the expanding wild which can give you big win if you get the high symbols next to the expanding wild symbol(s). Arcader looks a lot of the old fruit machine but with extra reels and paylines. I don’t really like the old fruit machine but this game is different from that. Good job with the gameplay guys I really love it. Like most Thunderkick games, Arcader is also has a too low payout. It has 15 paylines but the minimum bet is 20 cent which is doesn’t make any sense at all. Arcader is in this case a little bit expensive game, 20 cent per bet and a low payout. This is not attractive at all. I have tried a few times playing this game and I always end up with nothing. A message ‘big win’ pops up when you win 1,5 euro which is very unusual because that’s not a big win at all. There are too few high pay symbols in this game and this is also the main reason of the low payout. I think they should lower the price per bet to 10 cent instead of 20 cent and maybe this game will attracts more players to play it. I haven’t played the game for a while now and I don’t think I will in the future. I really also hope in the future Thunderkick will create better paid games otherwise all those low payout games will not be played at all, at least not by me. If you love great HD graphics and marvelous sound special effects I do recommend this game but if you play for the big hit you need to avoid Arcader.